Serenekids Summer Camp 2014 is back with its series of wonderful and enchanting summer camps and events that has been alluring kids always. Serenekids Summer Camp 2014 would offer training to kids this summer in various locations across Tamil Nadu, with its series of summer camps. The Serenekids Summer camp would help the kids to realize their full potential in terms of Physical, Intellectual, Social, Psychic, and Spiritual Potential for their balanced and complete all round Development. The training programs would motivate the children to critically question existing system identify issues of today and derive creative solutions. 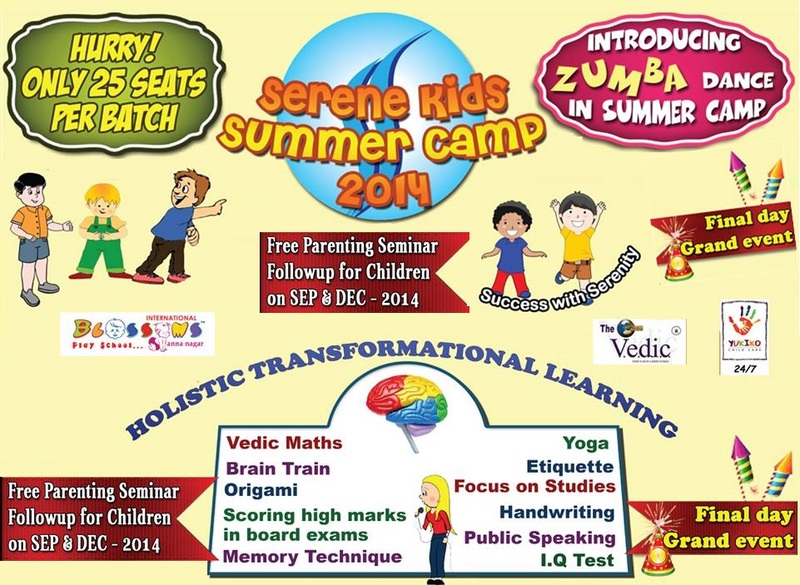 The topics to be covered at the Serenekids Summer Camp 2014 includes, Zumba Dance, Vedic Maths, Brain Train, Origami, Scoring high Marks in Board Exams, Memory Technique, Yoga,Etiquette, Handwriting, Public Speaking, Focus on Studies, I.Q., etc. to name a few. These courses apart, the first few registrants at the Serenekids Summer Camp 2014 would also get to attend a free workshop on Robotics, worth rupees 2,000. The parents of the kids attending the Serenekids Summer Camp 2014 would also be provided a free parenting seminar along with follow up sessions in September and December. So, Hurry and enroll your kids for the Serenekids Summer Camp 2014 to ensure that they have a productive and wonderful summer vacation where they learn the key skills that would shape their life forever. Serenewin as a part of the Human Capital Developers process provides complete corporate solutions such as, Recruitment Solutions, Placement Training Headhunting,Corporate training, etc. Founded in 2012,Serenewin was started in Chennai and Coimbatore, which was also planned with the aim to spread its wings of operations across the country in the days to come. In just two years since its inception, Serenewin now offers corporate training and other allied services for numerous corporates utilizing the services of its skilled professionals.